Working in the kitchen, Motorman relies on speech recognition technology to receive verbal orders from visitors. 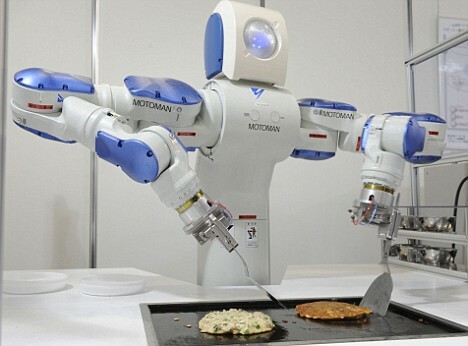 Using standard kitchen utensils, robot beat batter, leading it to an iron grill, forming a round pancake, flip it shifts to the plate and adds spices. On the taste of this product has not yet been discussed. This entry was posted on Tuesday, December 2nd, 2008 at 1:07 pm and is filed under robot news, robots. You can follow any responses to this entry through the RSS 2.0 feed. You can leave a response, or trackback from your own site.